Now that you have installed JungleMail, you can start activating its features. Note that, after activating these features, you will only be able to send group emails if all of the web application email settings are correct. If you want to find out more about these settings, read about the subscriptions and tracking configuration, and further customization here. This feature creates the JungleMail lists required for JungleMail functionality on a particular site collection. This is the main feature of JungleMail and should be activated for each site collection on which you are going to use JungleMail. This feature also enables the JungleMail Site Collection Settings. For site collections which will only be used for tracking and subscription management, we recommend to only activate the EnovaPoint JungleMail Publishing Web Parts Feature. Log in to the top-level site in the SharePoint site collection using the site collection administrator account. Go to Settings > Site Settings > Site Collection Administration > Site Collection Features. Locate EnovaPoint JungleMail Core feature and click Activate button to activate the feature for the entire site collection. After the activation of this feature, you will notice one document library and some lists have been created on the top-level site in the current site collection. 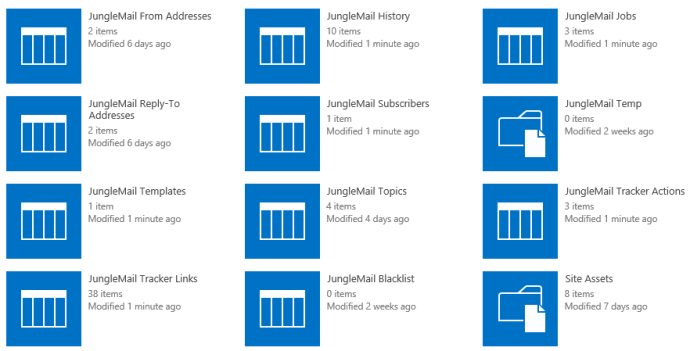 Here you can read more about JungleMail lists and permissions required. Note: you must repeat these steps for each site collection on which you plan to use JungleMail. This feature adds JungleMail Tracking and Subscriptions web parts to your web part gallery. Enable this feature on the site collection you are going to place web parts in. If you are going to send emails from an internal environment and track external/anonymous user actions, there is no need to activate this feature on an internal environment. You should activate it on the SharePoint site collection that is accessible by anonymous users, and on which the tracking and subscription management web parts will be placed. Locate EnovaPoint JungleMail Publishing Web Parts feature and click the Activate button to activate the feature for the entire site collection. Go to Settings > Site Settings > Site Actions > Manage Site Features. Locate the EnovaPoint JungleMail User Menu feature and click the Activate button to activate the feature for the current site. Note: you must repeat these steps for each site on which you are going to use the JungleMail user menu.